NEW ORLEANS – After weeks of turnover, the Men’s Watch List for The Bowerman — collegiate track & field’s highest honor — finally steadied out with the 2018 NCAA Division I Outdoor Track & Field Championships on the horizon. Nine men return from the previous iteration of the Watch List, as does another man who hasn’t been on the index since it made its debut on January 9. 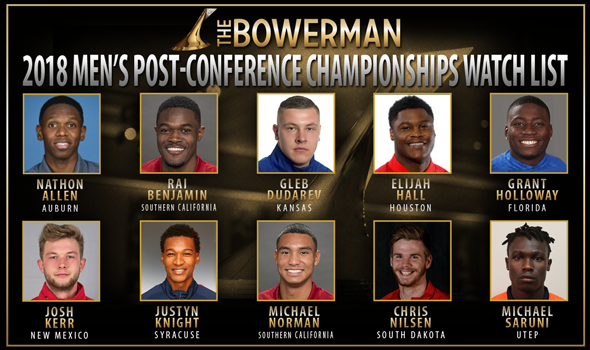 The Men’s Post-Conference Championships Watch List was released Thursday by the U.S. Track & Field and Cross Country Coaches Association (USTFCCCA). Also Receiving Votes: Denzel Comenentia (Georgia), Tim Duckworth (Kentucky), John Kyriazis (Texas A&M), Anderson Peters (Mississippi State). Auburn’s Nathon Allen is back on the Watch List after falling off the radar. Allen reappeared this past weekend at the SEC Championships where he won the 400 in 44.28, which made him the sixth fastest performer with the ninth fastest time in collegiate outdoor history. That came just a few weeks after Allen split 43.77 on the anchor leg of a 4×400 at the Penn Relays. The SEC Championships were also an opportunity for Florida’s Grant Holloway to shine. Holloway lowered his PR in the 110 hurdles to 13.15, which is the fastest time run by a collegian since Renaldo Nehemiah set the collegiate record of 13.00 back in 1979. The super sophomore also soared to victory in the long jump with a wind-aided mark of 8.32m (27-3¾) that also doubles as the No. 2 mark on the Descending Order List. He became just the second man in SEC history to win the 110 hurdles and long jump at the conference meet. Holloway added strong legs of the Gators’ 4×100 and 4×400 relays that both finished third. Southern California’s Michael Norman dazzled at the Pac-12 Championships. Norman won the 200 and 400 with all-conditions PRs of 19.84w and 44.40, respectively. That mark of 19.84 in the 200 is the fourth-fastest wind-aided time in collegiate history, while his time of 44.40 has him as the 11th fastest performer in collegiate outdoor history with the 17th fastest time. While Allen, Holloway and Norman were the only members of the Post-Conference Championships Watch List to alter the collegiate record book this past weekend, they weren’t the only ones to take home some impressive hardware. The other seven men on the Watch List – Southern California’s Rai Benjamin, Kansas’ Gleb Dudarev, Houston’s Elijah Hall, New Mexico’s Josh Kerr, Syracuse’s Justyn Knight, South Dakota’s Chris Nilsen and UTEP’s Michael Saruni – combined to win five individual titles at their respective conference meets. Benjamin crossed the finish line first during the 400 hurdles at the Pac-12 Championships and improved his nation-leading time to 48.46. He also ran a leg of the first-place 4×100 relay. Dudarev launched the hammer 72.73m (237-5) and won the Big 12 title by more than 24 feet. Kerr cruised to victory in the 1500 at the Mountain West Championships in 3:44.69. He also scored in the 800 with a time of 1:50.55. Knight captured another 5000-meter crown at the ACC Championships as he broke the tape in 13:58.69. He also scored in the 1500 with a time of 3:46.96. Nilsen cleared 19 feet for the third time this season in a winning effort at the Summit League Championships. The sophomore from Kansas City, Missouri, ended up at 5.80m (19-0¼). Hall and Saruni were the only members of the Watch List to not win a conference title this past weekend. The former finished seventh in the 100 at the AAC Championships, while the latter was beat to the line by one of his teammates in both the 800 and 1500 at the Conference USA meet. Four men from the SEC ended up in the “Also Receiving Votes” category: Georgia’s Denzel Comenentia, Kentucky’s Tim Duckworth, Texas A&M’s John Kyriazis and Mississippi State’s Anderson Peters. The next Watch List will be released June 4 on TrackTown LIVE prior to the 2018 NCAA Division I Outdoor Track & Field Championships.